This saves the Club several thousand pounds over the season. 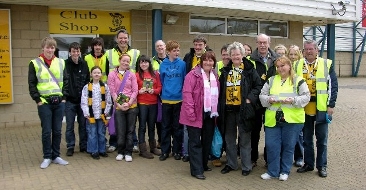 If you would like to help, simply email us or speak to a Trust board member at a home game. We really do need extra hands, so please help us to help the club. Every small bit of assistance the fans can give the Club can help. If you have any questions about volunteering, please contact the trust. We are in the process of changing our registered address, therefore, please do not send mail to Leving Place as we are no longer collecting mail from the address. If you wish to contact the Trust please either email us at Enquiries@liviforlife.com or contact a member of the board directlty. We are an open and transparent group. The Document Library section includes minute of meetings, e-newsletters, note of meetings with Livi FC and other partners, and annual account information. If you want to know more, please contact us.